Send flowers to celebrate an anniversary by Cascade Florist. Whether its 1 year of marriage, 10 years of marriage or a landmark anniversary like a Ruby, Silver or Golden Wedding anniversary. 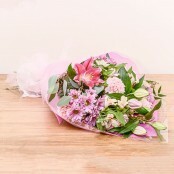 At Cascade Florist we will be delighted to deliver the perfect flower gift. Same day flower delivery can be arranged throughout Lampeter and surrounding areas.